From the time my first born proposed to his girlfriend and she graciously accepted, we didn’t know where to begin preparing for the wedding. After the initial excitement sort of ebbed a bit, the first thing I decided to do was to get the correct addresses of the guests to be invited. In this day and age of facebook, emails, whatsapp, twitter and super fast phone calls, most of us do not have correct physical addresses. Then came the issue of where the wedding will take place and what sort of ceremony will be performed as my daughter in law is french. Dubai to Mombasa and finally Chevreuse in France was decided. The task of organizing a wedding in France from Mombasa appeared taunting but became an easy team work between the two set of parents. My daughter in law’s parents came down to Mombasa to meet us and to set the ball rolling for preparing a wedding where both the french and indian culture would be taken care of. The next 11 months emails, messages on facebook, whatsapp, skype and phone calls between Mombasa, Chevreuse and Dubai kept on flying. What would we do without modern technology? A shopping trip to Mumbai and Bangalore was a delight.Traditional gujarati ceremonies like Ganesh pooja, haldi and havan took place at my dad’s home in London for my son. The whole family travelled by coach from London to Chevreuse crossing the English Channel by ferry. Its the first time that nearly the whole family travelled together for a wedding. Serving nearly 35 vegetarian Indians was not an easy task for the French chef and owner of Salon de la Merantaise. However, he overcame the request of no onion, no garlic, no fish, no eggs, no mushrooms and served us an excellent meal right from canapes, tomato and cucumber mini sandwiches, spinach pies to ratatouille, dauphinois gratin, couscous, polenta, yummy desserts and a variety of cheeses with an excellent choice of champagne and wine. During the whole week of celebrations we managed to serve typical gujarati meal, south indian, north indian, pizzas, chaat, mexican and french cuisine. After the wedding, the family spent time together, visiting the more famous sights of Paris. This was my first trip to Europe and I am glad that it was France that we visited. Chevreuse is a very beautiful valley and Paris is truly a romantic city. A romantic wedding in a romantic country followed by a reception in London for the rest of the huge family and friends wrapped up the celebrations. All this was possible because of the huge family support I got from my dad, brothers, bhabhis, sister, brother in law, cousins nieces and nephews. My morale booster and supporter during this whole time of preparation were my best friend Daxa and my daughter Nami. Now I am back to my normal life, no more emails, organizing, visa applications etc. My husband and I are spending some time with my other son in Montreal before we head back home around mid May. Neel’s friends had laid out a whole basketful of goodies, fruits,chocolate and cookies to welcome us. They also left a few vegetables for us which included enoki mushrooms. Next day Neel goes to the nearby supermarket to buy bread, milk, eggs and some greens as my hubby had suggested. He comes back home with mache. What is mache I asked him and he too had no idea. He just bought greens as told! I googled mache and it turns out that its used a lot in the french cuisine as a salad, cooked as a side dish with some olive oil or light cream. The leaves look like minature spinach and has a nutty taste.It is also called lamb lettuce, corn salad, nut lettuce and rapunzel. Enoki mushroom or enokitake (lily mushroom, golden needle mushroom) is a long thin white mushroom used in East Asian cuisine.The first time I tasted the mushrooms was during my last visit to Montreal. My son had ordered some sushi at home, I didn’t really enjoy the avocado and cucumber sushi but loved the salad that came with it. Enoki mushrooms have a crisp texture. I decided to be bold and prepared a salad with two new ingredients. 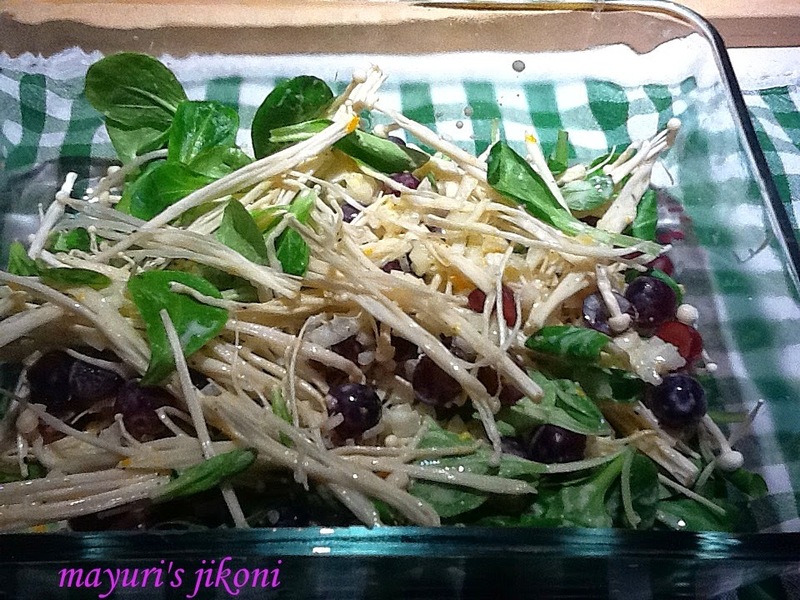 The result was yummylicious and I am waiting to get another packet of enoki mushrooms to make the salad again. If you get enoki mushrooms, try out this recipe. Wash the mushrooms and pat it dry on a kitchen towel. Trim off the hardy root part and gently separate the mushrooms. Wash the mache and pat it dry with a kitchen towel. Add the mushrooms, chopped onion, grapes and mache to a big salad bowl. Whisk the ingredients of the dressing together lightly and pour over the salad and serve. Use baby spinach or any other greens instead of mache. Use a fruit of your choice like strawberries, other berries, tangerine etc. If the mushrooms are sticky and slimy do not use them. Use left over enoki mushrooms in soups, omelettes, sandwiches etc. Use left over mache in sandwiches, soups. I used some to add to make a filling omelette with other vegetables. congratulations on your son's wedding. hope you guys have fun. salad looks amazing. That sounds like such an interesting combination. I have never heard of mache before but I am sure I would enjoy it and I adore mushrooms. Thanks for submitting this recipe to NCR. The roundup is a bit late, but it will be posted soon.